Dioscorea dumetorum (Kunth) Pax is a yam species of great potential but so far scientifically neglected in Benin Republic. Using participatory rural appraisal (PRA) tools and techniques, thirteen (13) villages selected according to the importance of species production in the northern and central Benin were surveyed to assess the endogenous knowledge related to its diversity, production, conservation and use. According to synonymy, 18 landraces of D. dumetorum were identified and gathered into three groups. The main criteria used by farmers to describe the three groups of D. dumetorum are shape, flesh color, color and appearance of the skin of the tubers. 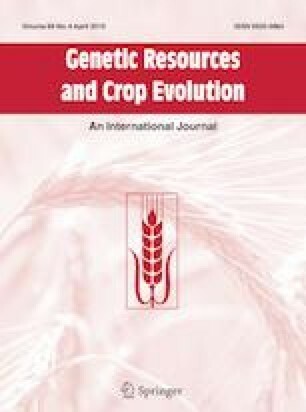 According to this study, the landraces group that produces round or elongated, yellow-fleshed, gray-skinned and smooth tubers with a few rootlets at their head is most cultivated in the study area. In addition, polyculture (59.53% of responses) is the predominant mode of culture. For the farmers surveyed, the production of D. dumetorum is declining due to several constraints where the most important are attacks of tubers by termites, lack of markets for the flow, long production cycle and maladjustment of any landraces identified with crushed yam, chop and stew. Storing tubers in heaps under the tree is the most common and widespread method of post-harvest conservation (65.60%). For all ethnic groups involved in D. dumetorum production in the study area (Yoruba, Fon, Otamari, Lokpa, Bariba and Peulh), the crop has a high food value. For some of them, the species also has a significant potential to play an important role in spirituality, human well-being and improving health. This study was carried out as part of the Master’s Degree in Biotechnology, Plant Breeding and Seed Production (BAPROS) obtained at the Faculty of Science and Technology (FAST DASSA) of the National University of Sciences, Technologies, Engineering and Mathematics (UNSTIM ABOMEY) through the theme “Endogenous knowledge, post-harvest conservation and genetic improvement needs of Dioscorea dumetorum (Kunth) Pax in northern and central Benin”. We express our sincere thanks to all people those contributed to study realization mainly the farmers, village leaders and local authorities who have agreed to collaborate with us and share their endogenous knowledge of D. dumetorum with us.